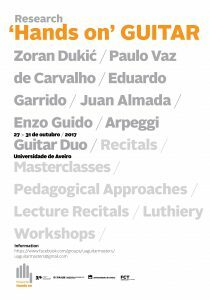 Research “Hands on” GUITAR – which will take place at the University of Aveiro on 27-31 October 2017 – is a meeting dedicated to Classical Guitar. Its uniqueness lies in the rare meeting of multiple knowings around this instrumental area: Research, Composition, Interpretation, Performance Studies and Instrument Construction. The aim is to ensure that the convergence of various artistic and research activities will enrich all people directly involved, thanks to their confrontation and knowledge sharing. It is our intention to upgrade the event in 2019 adding a call for works, widening in this way the spectrum of experiences and knowledge.